Over 300 people took to the streets in Halifax for a march and rally protesting the G8 Development Ministers Meeting in the city. 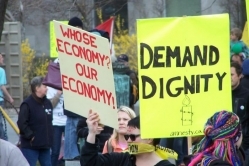 The mobilization was organized by a wide range of activists, labour organizers and civil society groups proclaiming that the G8 leaders' worldview is not their own. The next morning a group of protesters marched and picketed the Development Ministers Meeting, prompting the arrest of one union organizer. At the meeting Bev Oda, Minister for International Co-operation, announced that Canada's Maternal and Child Health Plan would define family planning in a manner "which does not include abortion," sparking criticism from opposition MP's that the Conservatives were re-opening the abortion debate in Canada. A new report from the Native Womens' Association of Canada has added 62 names to the list of missing and murdered Indigenous women in Canada, bringing the current total to at least 582. A New Brunswick-based Aboriginal Group and three Moncton area Metis are suing the New Brunswick and federal governments for $13 billion for genocide and loss of unceded territory. Documents released by Canada's Department of National Defense show that Canadian Forces spent over $6 million dollars having troops trained by the private security company Blackwater (now known as Xe Services). The mercenary company, which has been involved in a number of cases involving civilian killings and other illegal activities while working under United States contracts in Afghanistan and Iraq, trained Canadian soldiers between 2005 and 2009. Sources with the military refused to confirm or deny whether the relationship is ongoing. In Montreal an Immigration and Refugee board has ruled to deport Dany Villeneuva, the brother of Fredy Villeneuva who was killed by a Montreal Police officer last summer. The board claims Villeneuva's 2006 conviction for armed robbery is grounds for his deportation. Critics are suspicious of the ruling, given Dany Villeneuva's role as an key witness at the ongoing inquest into his brother's killing. Simultaneous protests in nine Brazillian cities disrupted the bidding for the Belo Monte Dam project. Despite the pressure, a second injunction was overturned and the bidding process went forward. If built, the dam would affect 45,000 people and destroy vast areas of tropical rain forest through flooding and diversions of the Xingu River. The Supreme Court of Canada has granted intervener status to two Alberta First Nations communities, the Duncan and Horse Lake Nations, in relation to the Athabasca tar sands, granting them a legal channel to challenge developments. A new study revealed that from 2000 to 2005, over a million square kilometres of forest were lost due to human distrubances and natural causes, representing a 3.1 per cent loss of total forest. The study also showed that North America suffered the highest percent of losses of the world's continents, accounting for thirty percent of the total forest loss. Paramilitary forces in Oaxaca, Mexico, shot and killed one Mexican organizer and one Finnish solidarity activist during an attack on a human rights convoy destined for the community of San Juan Copala. Five others have been confirmed as missing. A total of 22 people are unaccounted for, including local organizers and journalists. At a press conference in Ottawa a petition endorsed by 505 recipients of the Order of Canada was presented to call on the Canadian government and others to support an international ban on nuclear weapons. An offshore oil rig exploded off the shore of Louisiana in the Gulf of Mexico. Eleven workers are still missing and presumed dead. 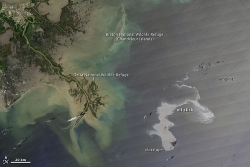 It is estimated that as much as 5,000 barrels of oil were leaking per day, creating an oil slick that covered 32 square kilometers and continued to grow. Petroleum giant BP was leasing the rig and is now taking the lead in the cleanup. The World People's Conference on Climate Change and the Rights of Mother Earth took place in Cochabamba, Bolivia. The civil-society climate conference was called after the failure of the Copenhagen talks last December. The conference drew over 30,000 people from across the globe and proposed a number of solutions, such as a Climate Justice Tribunal, global referendum, and a declaration on the rights of Mother Earth to be presented as the Cochabamba Accord at the United Nations Cancun climate summit this December. During the conference, local Indigenous groups held a self proclaimed "rebel workshop" called Mesa 18 to discuss and confront the Bolivian government's own actions regarding mining on Indigenous territories. Hundreds of people participated in a pilgrimage to Burns Bog in BC's Lower Mainland to protest proposed highway development across the sacred site. In Montreal and from phones across Canada, 120 people risked federal prosecution by donating to a "sanctions-busting telethon" held by the People's Commission Network to raise money to assist Abousfian Abdelrazik as part of their Project Fly Home campaign. Abdelrazik is listed on the United Nation's 1267 list (the so-called "no-fly list") and is therefore subject to sanctions that state no Canadian shall "provide or collect by any means, directly or indirectly, funds with the intention that the funds be used" by anyone one the 1267 list. Both CSIS and the RCMP have said they have no evidence of Abdelrazik being linked to crimes or terrorist activities. Avatar Director James Cameron held a special screening and meeting with members of Indigenous communities from Canada and the United States. He spoke with George Poitras, former chief of the Mikisew Cree nation in Fort Chipewyan and representatives of the Indigenous Environmental Network to discuss the tar sands and making plans to visit Fort MacMurray.